Start your day off right with egg recipes that are both nutritious and warming. These egg-cellent ideas work for everything from quick weekday breakfasts to lazy weekend mornings, and even special-occasion brunches. From classics like scrambled eggs and omelets to flavor-packed breakfast burgers and avocado toasts, these recipes are guaranteed to upgrade your morning. 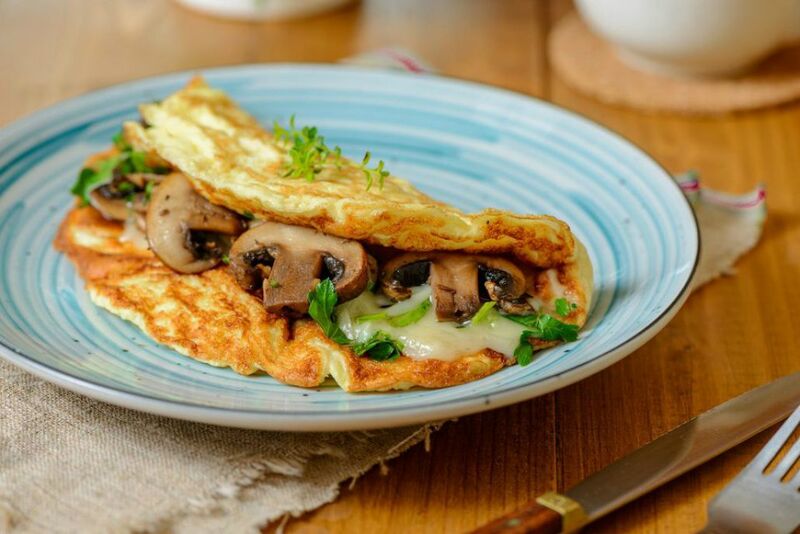 Have you always wondered how chefs make such perfect omelets? This genius recipe gives away their secrets, including tips on pan choice, cooking technique, ingredients, and how to transfer it to a plate while keeping the omelet intact. Whole wheat toast topped with a perfectly poached egg, creamy avocado slices, and a drizzle of Sriracha is the breakfast that launched the avo toast craze. A poached egg tutorial is included in the recipe. Say bonjour to the croque madame, the dressed-up cheese toastie that's one of France's most popular exports. Take a grilled ham and cheese sandwich, add one fried egg, and pour some creamy bechamel sauce over the top. Voila, breakfast! Dig into a hearty breakfast casserole made with eggs, bread, sharp cheddar cheese, and smoked chicken sausages. Make it the night before and pop into the oven in the morning for an easy and warming family weekend meal. Use a cast iron skillet to make this savory egg frittata with bacon and cheddar cheese for easy transferring of the dish from stovetop to oven. Whole milk is used to add nice body to the eggs, giving them a custard-like texture. Learn to make classic, delicious French toast and you'll always have a go-to recipe when guests descend for breakfast or brunch. Serve it with maple syrup, and see the tips and variations in the recipe for more ingredient ideas and topping suggestions. Mornings are tastier with this explosively delicious breakfast grilled cheese. It's made with creamy scrambled eggs, tangy goat cheese, and a homemade arugula-walnut pesto, all sandwiched between two slices of crispy buttered whole wheat bread. Classic eggs Benedict is a popular brunch dish and makes a special treat any morning. Toasted English muffins are topped with rounds of cooked ham or Canadian bacon and poached eggs, then smothered in creamy hollandaise. Want your kids to eat a healthy breakfast, but can't make them sit still? Nutritious sausage, egg, and cheese breakfast muffins with spinach deliver plenty of protein, dairy, carbs, and greens in one easy-to-eat package. Have you been looking for the perfect scrambled eggs recipe? This foolproof version produces a buttery scramble with the perfect texture. You may never use another recipe. Italian-style eggs in tomato sauce are super warming on cold weekend mornings. Eggs and mozzarella cheese are cooked in a simmering sausage-tomato sauce with fresh parsley and grated parmesan cheese. Serve with toasted Italian bread. Dig into the most popular breakfast in Spain when you bite into this fantastic egg and potato omelet. Enjoy it with a side of hot buttered toast or place it between baguette slices for a filling breakfast sandwich. English muffin fried egg breakfast "pizzas" are a great way to load kids up with protein in the morning. Prepared spaghetti sauce, mozzarella, and Parmesan cheese will make your family say mamma mia! 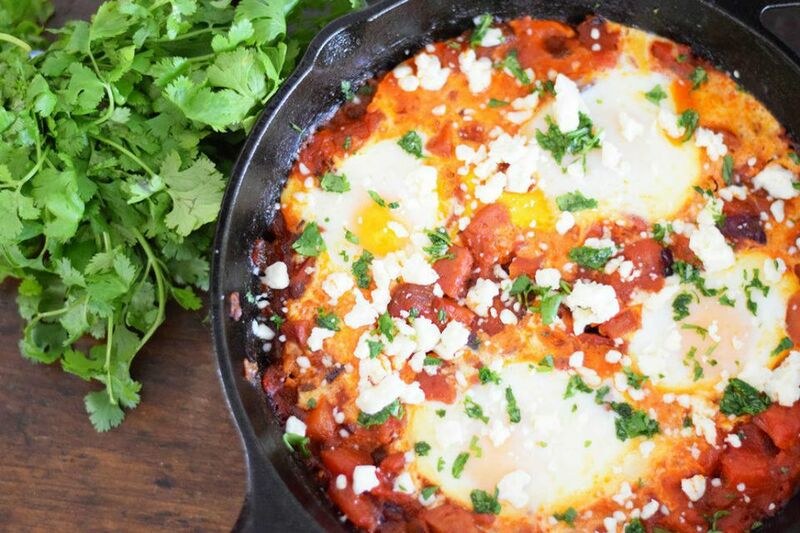 Shakshuka is a spicy tomato and poached egg dish native to North Africa. You'll only need one pan for this family-style breakfast, which fills hungry stomachs up with eggs, sausages, tomatoes, onions, and Mexican cheese. Do you like diner breakfasts, but want to stay in your jammies? You're sure to love this awesome breakfast grilled cheese loaded with scrambled eggs, avocado, chorizo sausage, and two kinds of cheese. Avocado halves are transformed into edible "nests" in this ingenious baked egg dish. The recipe is easy to whip up, require minimal cooking tools, and are great to take on-the-go. There are many ways to vary up the toppings, too. Quiche Lorraine is a French bistro classic that you can adapt to suit your tastes, adding meat, leftover cooked veggies, or seafood. This recipe uses a prepared crust to speed up prep. Piled high with ham, onion, bell pepper, and cheese, the Denver omelet is a diner classic. If you like your eggs spicy, add some diced jalapenos before cooking or drizzle the finished omelet with Sriracha. This overnight crockpot breakfast casserole makes it a breeze to roll out of bed and enjoy a nutritious breakfast. Hash brown potatoes, eggs, and ham team up in this make-ahead recipe, along with lots of shredded cheddar cheese, fresh chopped veggies, and seasonings. Skip the fast food line-up and make these irresistible breakfast sliders in your own kitchen. Baked eggs, country sausage, and sliced cheese are layered into fluffy slider buns for a tasty breakfast on the go. Eggs in a basket—also called "toad in the hole"—is a kid-favorite breakfast that's easy for little hands to help you make. A fried egg snuggles inside pan-toasted bread for a protein-packed morning meal. Spinach, onions, and ham are baked in a custardy filling to make this tasty breakfast quiche. The recipe includes tips for an excellent pastry, but this quiche is also delicious made crustless on days when you're pressed for time. When you're looking for a special breakfast dish, try this European-style recipe. Perfectly poached eggs are nestled into a bed of fresh, healthy spinach atop toasted English muffins and slathered with buttery hollandaise sauce. Whip up this hearty casserole with all the great tastes of a Western omelet the night before and pop it into the oven in the morning for a great family breakfast. Ham, onion, and chopped bell pepper go into this easy one-dish breakfast, along with eggs, cheddar cheese, and cubed bread. Frittatas are fluffy baked omelets that make a great meal in one dish. This nutritious version is loaded with veggies, including mushrooms, potatoes, asparagus, and tomatoes, along with eggs, turkey bacon, and Parmesan cheese. Chunks of leftover baked cornbread form the base for these single-serve breakfast casseroles. Assemble the individual ramekins with eggs, bacon, ham, or sausage, and your favorite shredded cheese. No cornbread? Use cubed bread instead. Cute little muffin cup quiches are a great way to get the kids to eat their veggies! This recipe is vegetarian-friendly, but meat-eaters can add some crumbled bacon, diced ham, or cooked sausage. When you wake up with a powerful hunger, bite into this fully-loaded, restaurant-style breakfast burger packed with avocado, egg, gouda, tomato jam and bacon. Dig into a filling breakfast bake made with whole eggs, thick bacon, and shredded cheddar cheese, and crunchy breadcrumb coating enriched with cream. It bakes quickly for a fabulous one-dish breakfast for a family of four. What are marbleized eggs? Find out in this recipe, which uses them in a hefty breakfast sandwich. Crispy bacon, mild muenster cheese, and tangy onions are all loaded into an everything bagel. Talk about a great way to eat your greens! Leafy kale abounds in this tasty puffed frittata, which can be cut it into pie-like wedges for serving. Sprinkle some feta or goat cheese on top for an extra creamy finish, and plate with some lightly-dressed salad greens. Use individual ramekins to bake these shirred eggs with cream, butter, and cheddar cheese. Add some cooked crumbled bacon if you'd like, or serve them with fresh sliced tomatoes or fruit, for an elegant breakfast treat. If you enjoy sweet, savory, and spicy breakfast sandwiches, then this everything bagel-wich is for you! Made with bacon jam, cheesy scrambled eggs, and pickled jalapenos with a smear of smoky paprika aioli, the flavors are sure to knock your pajama socks off. Pain perdu is a delicious French toast that's a great way to use up day-old bread. Its name literally means "lost bread," stemming from its origins in New Orleans as a way to save stale loaves that were about to be thrown out. A fried egg is added to the classic bacon, lettuce, and tomato sandwich, in this popular BLTE breakfast sandwich recipe. You'll love the included tips for making basil aioli, too. Enjoy this Japanese-American breakfast mash-up any morning when your body craves protein and carbs. A thin omelet is wrapped around vegetable fried rice and topped with ketchup. Here's an elegant omelet that looks beautiful on the plate and is a fabulous way to use up asparagus from your fridge. Serve it with croissants or popovers for a perfect Mother's Day breakfast or Easter brunch. If you agree that spice is nice in the morning, you'll enjoy this Louisiana-style quiche loaded with cheddar cheese, Creole seasonings, and heat from spicy andouille sausage. The recipe will make two quiches. Make over your usual morning scramble by adding salmon! Creamy scrambled eggs with luscious chunks of smoked salmon folded inside are special enough for an anniversary breakfast or special-occasion brunch, especially when served with croissants. Travel south of the border without getting out of your robe with this homey Mexican-style breakfast. Warmed corn tortillas are layered with softly fried eggs, then smothered in tomato-based ranchera sauce. Craving a stomach-filling breakfast? This incredible omelet has got you covered with all of the amazing ingredients that go into a Philly cheesesteak sandwich, including sliced steak, shredded cheese, and onions, plus eggs. Try this filling breakfast idea for days when you literally have to grab your meal and go. A flour tortilla is stuffed with creamy scrambled eggs, chorizo sausage, and shredded cheese. It freezes well for a handy make-ahead breakfast. Kid-pleasing hash brown egg breakfast casserole is a great way to start the day on Christmas morning or any lazy weekend. Using frozen or refrigerated hash browns makes it easy and quick to assemble. Gorgeous fluffy eggs in puff pastry make a wonderful special-occasion breakfast and it's easy to pull together with store-bought dough and prepared alfredo sauce. Make it up to two days ahead and warm before serving. Yes, you can get the kids to eat spinach for breakfast! Greek pitas form the crusts for these nutritious "pizzas" topped with a super-cheesy creamed spinach mixture, plus lots of shredded mozzarella cheese. Adorable ham and egg cups are so delicious and easy to prepare, they might become your go-to trick when guests are coming for brunch. Muffin tins are lined with ham, creating savory, edible vessels for baking eggs inside. Corned beef hash with eggs is a classic country breakfast that makes a hearty Christmas morning meal. Potatoes, cooked corned beef, onions, and bell peppers are tossed together and topped with perfectly fried eggs. Craving a savory morning meal? A simple curry sauce adds zip to hard-boiled eggs while a little lemon juice lends zing. Eat it the traditional way, served over toast points or hot rice. In this classic pub-style recipe, hard-cooked eggs are enrobed in a savory sausage crust, baked in the oven, and served with a creamy butter-Dijon mustard sauce. Serve them for a treat on Christmas morning. Latin-style arepas con huevo are delicious corncakes fried in oil, then split and filled with an egg and fried again. You can find the special cornmeal for making arepas in Latin markets or the Latin food section of some supermarkets.